I finally finished the bamboo composite that I was working on as a practice bow. I figured I'd work out the technical procedures on less expensive bamboo before I went on to horn. 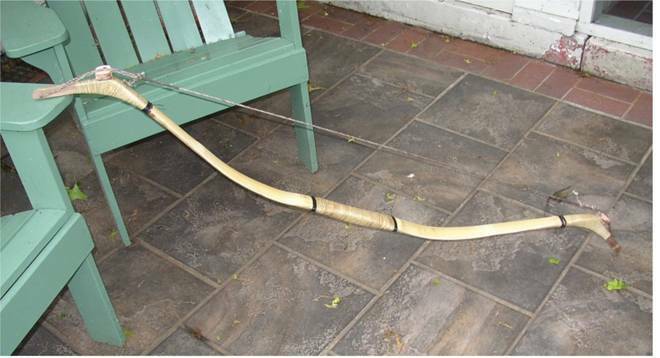 The bow is made of nine pieces of wood; the birch core, the bamboo strip used for the belly, the handle riser, and the siyahs which were each fabricated from three pieces of black walnut spliced and glued together. After an initial tillering problem that Adam K. helped me sort out, I ended up with about four layers of sinew -- sanded down from six. A good thing too, because the finished bow was a 65 pound draw when initially strung up and tillered to 28 inches. I left it strung for a week to make sure it was settled to the string, then began to slowly draw it further and further. It has been to 30 inches on the tillering board, but I can only draw it to about 27. When unstrung it was at 55 pounds. Restrung the next day, it was at 60. That seems to be the average of the bow; it varies depending on humidity and temperature. This first picture is the bow on the tillering form before first stringing. Reflex was kept to about 14 inches because of the lower compression properties of the bamboo. Bow length is 56 inches nock to nock. The below image is a picture of the bow at nearly full draw (sorry, the guy taking the pictures couldn't time it to get full draw). It is at about 27 inches here, pulling 60 pounds. Difficult to shoot so far as it is about ten pounds heavier than most of my other bows. I finished it with a layered and distressed look, several layers of red, yellow, and brown dyes on the belly, sanded through to make it look antiqued. I applied wraps of red silk and metallic silver thread, then antiqued with a thinned-out dark brown dye. I applied a clear satin lacquer over all for water protection. The bow looks very old, fooled a few people at the shoot I was at down in Friendship, Indiana. I showed it to Vinson Minor at the shoot and he gave me some pointers for the next effort, the horn bow. used four if I had used back-strap sinew and done a more neat job of it -- as is, I had leg sinew and had to sand it down to get it smooth enough. As stated above, this bow was a "practice bow" for my first horn bow attempt. It is patterned after the Tibetan bow, info about which you can find here on ATARN in the archives. 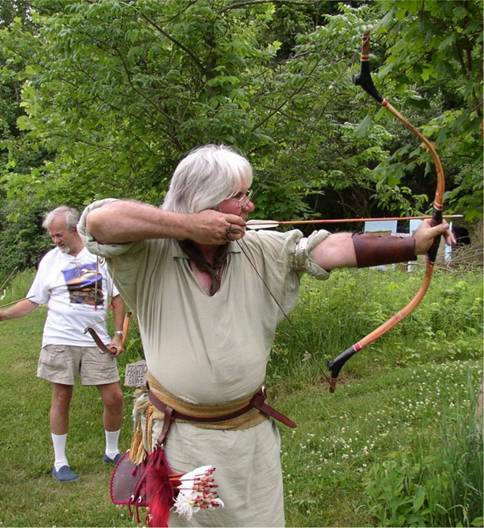 There is also some info about bamboo bellied bows in an archived post called, if memory serves, "an interesting bow design," by Tom Duvernay. opposing limb until both bent the same. The stiff portions of the limb are due to A) reflex in that portion of the bamboo, and B) the glue joints of the siyahs and thicker core at that point. When I do the horn bow I plan to make it more of a Crimean Tartar design so as to minimize the mass of the siyahs -- the Tibetan design had the more massive Chinese style siyahs. As with most composites and some sinew bows I have, you have to balance the bow and sometimes align the tips when first strung after break in. A little pressure on the bending portion of the limb, or tying the string to the rounder limb with a bow bag seems to do the trick. Twisting siyahs will bring them into line, but of course with a tree-piece spliced siyah I am hesitant to put too much sideways twist on the joints. What I WILL do in my horn bow is make the core a lot thinner. Adam K. advised me to make the sinew at least 3/16 inch thick, so I plan for the core to be 1/8 and a 1/8 inch thick horn in the bending part of the limb. The core thickness seems to determine final draw weight much more than sinew thickness. If too light one can always add sinew, but if too heavy due to core thickness you are out of luck. The core on the bamboo bow was about 3/16 inch through the bending part of the limb, almost 1/4 inch where the siyah is spliced in. Incidentally, these were three-part siyahs; I won't do that in the horn bow, but will use one piece of the proper angle spliced into the core. I also intend to carve a one-piece handle section, the way a Turkish bow is built, as opposed to the glued on riser. I feel this will give more stiffness to the handle section and allow me a narrower grip. I have built sinewed Osage bows with smaller recurves that are faster than this bamboo composite, and I put that down to mass in the tips, So my next bow will have narrower and shorter tips. Tip alignment was accomplished by making the tips full width -- about an inch wide -- and then rasping them to shape once the back sinew had dried so that they lined up. With one-piece siyahs, especially Osage or mulberry, one could heat and twist to align. Using bamboo -- or any high compression wood such as Osage ipe or even yew heartwood -- does not shorten production time as the sinew curing is what determines that. Alberto on this forum has stated that he uses just two weeks drying time in between courses and finishes a bow in two months or a little more. Norm Blaker of Michigan puts all of his sinew on at one time, allowing only a couple of hours in between courses to let the previous course set up and gel. He then lets it all dry for a month or two. I think I'd be more inclined toward Alberto's method. Since even high-compression wood is not horn, I would keep the reflex modest on a bow of this type. With my initial 13-14 inch reflex, I maintain the tips 6-7 inches in front of the grip when first unstrung, more than enough for superior early draw energy storage. Vinson Minor makes a bamboo backed bow, Osage for the belly, that has about that amount of reflex when unstrung.